Recently I visited to Disney World in Orlando. I find magic really exists in the both real and online world of Disney. Since I write blogs as well, I have studied why its blog is so popular out of envy! 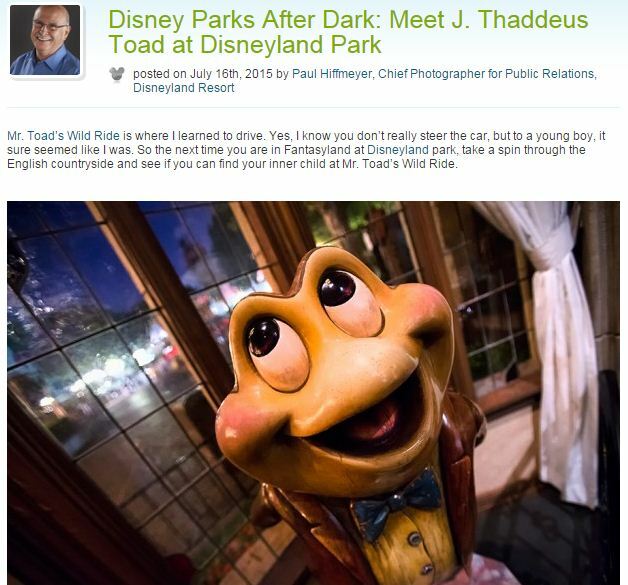 There are 5 magic strategies that help the Disney Company Blog is deeply loved by fans. Disney Company has an advantage of using celebrities to increase the blog’s traffic as it has built innumerable stars that are deeply affected by everyone’s favorite, like Mickey, Cinderella, and Mike Wazowski etc. 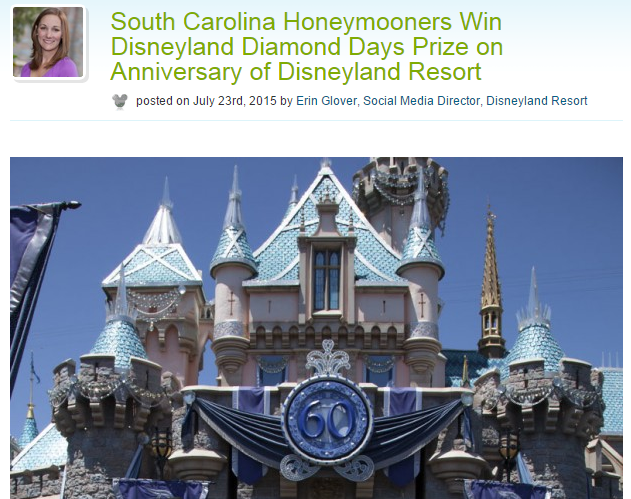 So its bloggers often write posts about Disney stars in order that strike a chord with readers. There is no doubt that, when we are reading these blogs, all the sweet memories of childhood will come back again. There are many ways can engage with readers. 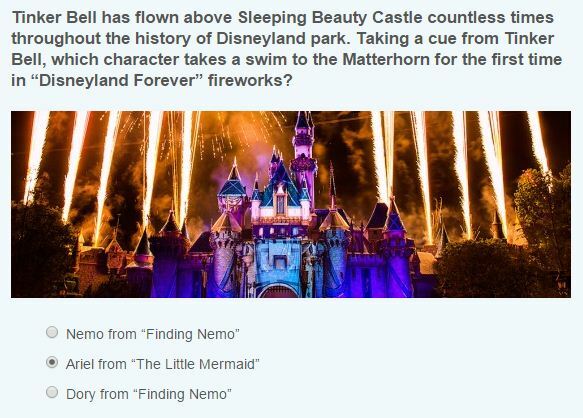 However, Disney has the most especial one —– Quiz! I felt so confused why lots of people participated in its quizzes. Are school quizzes not enough to them? Anyway, Disney caught the curiosity of readers successfully. 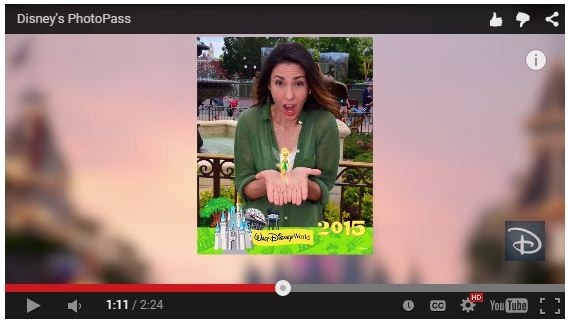 Disney highlighted company’s new service —— “Photopass” via video blog. 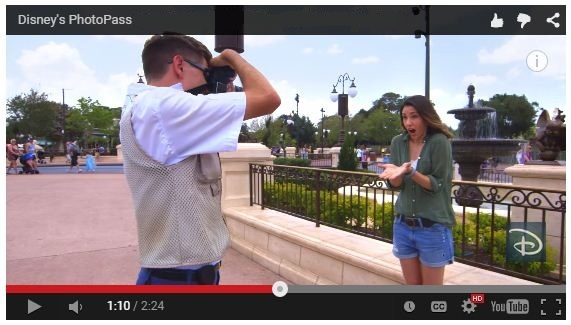 It illustrates how to use Photopass and the magical effects of using Photopass to tourists directly and clearly. The only drawback is: they didn’t mention that this amazing service cost more than 300 USD. Sharing company breaking news on blog enable Disney connect visitors with real time information. Disney has different kinds of posts, for example interview posts, list posts, informative posts, video posts and quiz posts etc. Different kinds of posts contribute to emphasizing different contents. Meanwhile these variations can keep interest and freshness of the blog. There was a time when traveling without a photo was acceptable. But I could not remember when it was since I wasn’t born yet. Nowadays, almost everyone takes photos when they are on vacations for recording the moment of happiness and breathtaking landscapes, or, just for their Instagram. However, you may ask: how can we take good photos? How can I make sure my girlfriend is beautiful in pictures in case she has a reason to flare up at me? What kinds of cameras are better choices for travelling? Today, I interviewed a professional photographer—-Lei Tao, who has 15 years experience for photography techniques. He answered my questions and shared us some key and useful tips of taking good travel Photographs. I hope you will like that. Celine: What kinds of cameras are good choices for traveling? Could you recommend a model for us? Lei Tao: Don’t influence you beautiful mood when you are on vacations due to a heave and complicated camera. Just keep it simple, light, and high zoom ratio. I would like to recommend Sony RX100 Digital Camera which has nice feel, full functions, high effective pixels (20.2 million). In a word, the level of image quality can rival SLR Cameras. However, it is more user-friendly and easier to operate. Celine: Could you please give us some suggestions for taking good landscape photography? Lei Tao: The first tip is about time. It is better to take pictures at the earlier morning or later evening. During these period times, the colors of sky are rich and clouds are changeable and colorful. An impressive aesthetic visual impact may be achieved if you use these times. The second tip is about positions. 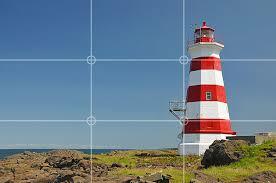 Divide a frame into thirds (both horizontally and vertically). Then place you subject at any one of these four circles. The last tip is about angles. Usually, when we are shooting landscapes, using a wide angle lens is the most common technique. This skill will exaggerate depth and relative size in a photo, so that can emphasize subjects and expand backgrounds. “Could you please give me some suggestions for portrait photography, so that I will be adored by my girlfriend?”—-Ken. Well, let me translate it to you: I am begging for your suggestions, so that my girlfriend won’t get mad at me any more due to such ugly pictures. Lei Tao: Haha, the first rule is avoiding back-lighting. Otherwise, photos will be very dark. Then, avoid taking pictures from 10am-4pm. During this period time, the sun angle is too high, so that there will be lots of shadow on faces. Last, never crop off at the joints. If Ken applies this tip, his girlfriend will have a golden ratio in photos. P.S: Crop at green lines. Never crop at red lines. Celine: I really do not like to bring too much stuff when I enjoy my vocations. Can I just use iphone for shooting? Lei Tao: Of course you can! Actually, if you just take photos for fun and social media network instead of professional tasks, iphone 6 and iphone 6 plus can completely meet your needs. Just remember, stay away from using zoom as much as you can, otherwise you will decrease photos’ quality. Celine: What tips you want to add to travel photography? Lei Tao: Protect camera lenses away from thieves. To a photographer, camera lenses are important equipment. However, they are also objectives of thieves as lenses can be sold at good price. Carry gears with you instead of sending them in suitcase when you take the flight. When your bag is full of lenses, always keep an eye on it. Above all are contents of this interview. Thanks Lei Tao again. Which tips do you like most? 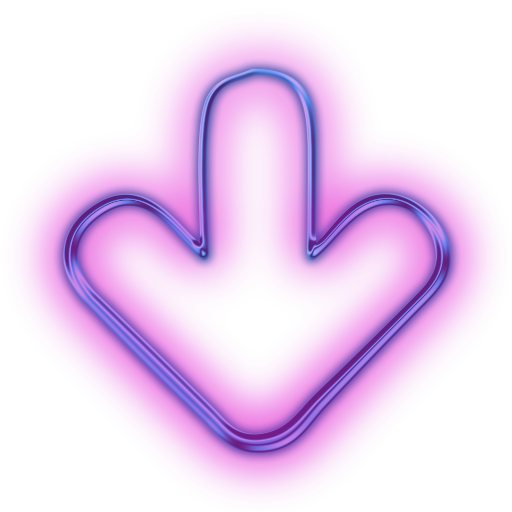 What are suggestions that you want to share with us? Please don’t hesitate to leave your comments. Fairmont Le Chateau Frontenac, the most charming hotel in Quebec, is endowed with rich history and modern innovations. 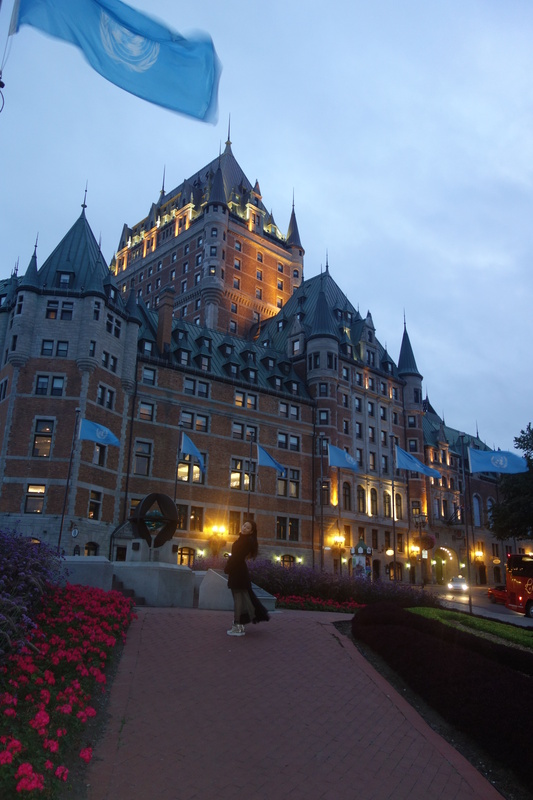 I believe that staying in Château Frontenac is every tourist’s dream. However, the accommodation is expensive by normal standards. Is it worth to spend at least 450 CAD for staying there one night? Today I am going to write a detailed review for Fairmont Le Chateau Frontenac to help make your decision. In my personal view, scenery& culture are the heart of Château Frontenac. When I stayed in here, I felt I was in the Frontenac’s Age. The ancient furnishings imparted an air of elegance to the hotel. From my room’s window, I could see the breathtaking views of the St. Lawrence River. Each night I fell asleep with the music of the river chimes, and each morning I woke up with gentle clops. Such antique and leisurely flavor made me forget all my worries. Tips: Some rooms in Château Frontenac haven’t views. So ask for a river view or a view of the old city in advance. The service in this hotel is excellent. The staff was very gracious and helpful. Tips: Château Frontenac doesn’t provide free Breakfast buffet ($28/person) which is worth a try. Château Frontenac has a great location! It’s very convenient for tourists because it’s very close to landscapes, restaurants, and gift shops. On the outside of the hotel are the stunning sceneries of the Old Quebec City. I loved to walk along these meandering cobblestone streets to explore this ancient city. However, I have to mention that Château Frontenac does not provide shuttle bus to the airport. You can arrive there by taxi, public transportation, or driving. Tips: Taking taxi from airport charges you around $43. Parking in the hotel charges you $34 per day. My room was cozy, and the bed was very comfortable. Facilities in my room included air-conditioner, alarm clock, cable television, Wi-Fi, hair dryer, iron, telephone, mini bar, and video check-out. Because I was sensitive skin, hotel offered me hypo allergenic duvets. Tips: There are no microwave ovens. Besides, mini-fridges and Wi-Fi charge money. The expense of staying here was not cheap, but I found some great deals on Expedia. Booking on Expedia helped me save almost $100 per day. Tips: If you decide to reserve a room on Expedia, the earlier you book, the lower price you get. The table below is a comparison of price on official website and Expedia. “Fathom Way To Go”, “ORBITZ Travel Blog”, and “Triplt Blog” are the top three romantic blogs. One of the hot topics is “The Best Destinations of Honeymoon”. It inspirits me to write this blog. In this passionate summer, I prepared top 5 oceanic islands for your romantic honeymoon. 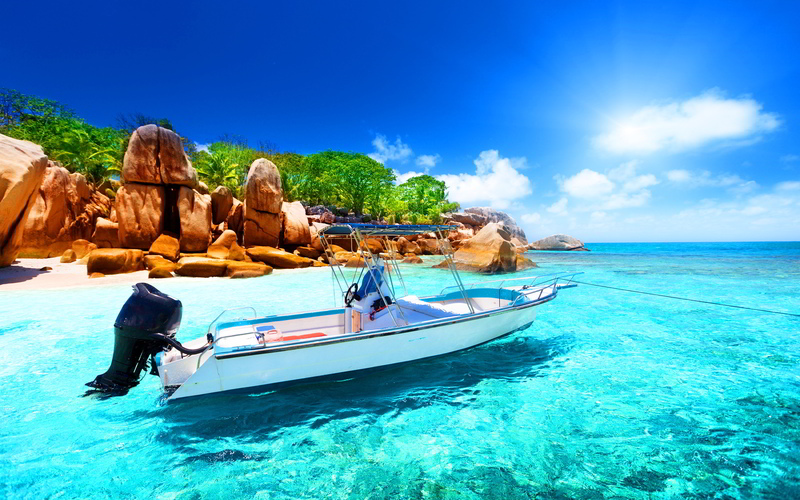 When I began to realize Seychelles, I understood why princesses Kate chose this African island for her honeymoon. There are pure white sand beach with all the trappings of tropical island life. Life becomes simple in here. You can swim, snorkel or just laze on the quiet beach under bright blue skies. You can see the most beautiful sunset in the world and the shadow of coconut trees sliding gently into translucent water. Here is the God’s aquarium. Here is the hometown of rainbow. Here are seven colors in the seawater. Here is the place you cannot miss in your life. Here is Palau. 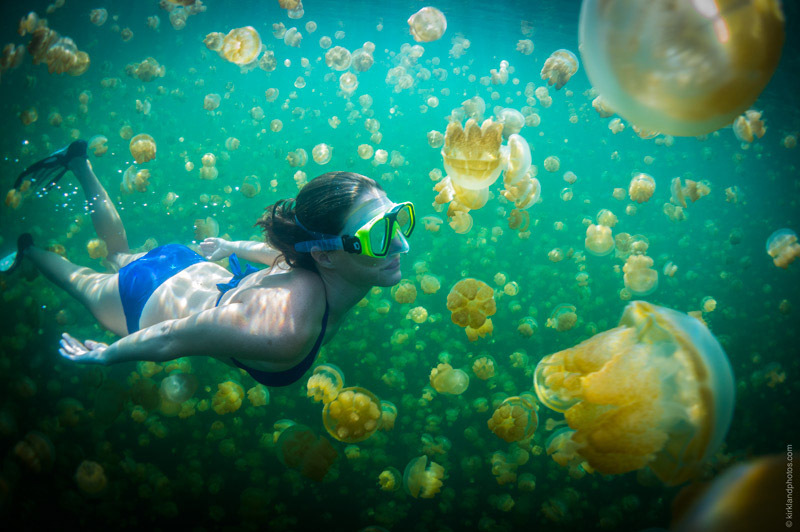 In here, you can dance with jellyfishes because Palau has a unique non-toxic jellyfish lake. Even, you can dance with sharks because Palau’s ecological environment shaped sharks friendly character. I know it looks crazy, but in history, shark attacks have never happened in Palau. 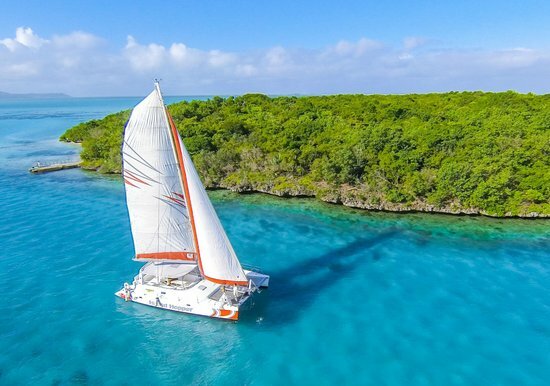 Mauritius is famous with the crystal clear water and sky. Except sunshine and beach, it is sending out the French romantic feelings and British elegance. In here, you can shut out the rest of the world and enjoy a private beach and yachts bit. Paradise island is located in the Bahamas. Pink sands beach has a reputation as the sexiest sand in the world. Close your eyes. And just imagine: You’re lazing on a pink sands beach lapped by royal blue waters and listen to the song of the sea. How romantic it is. 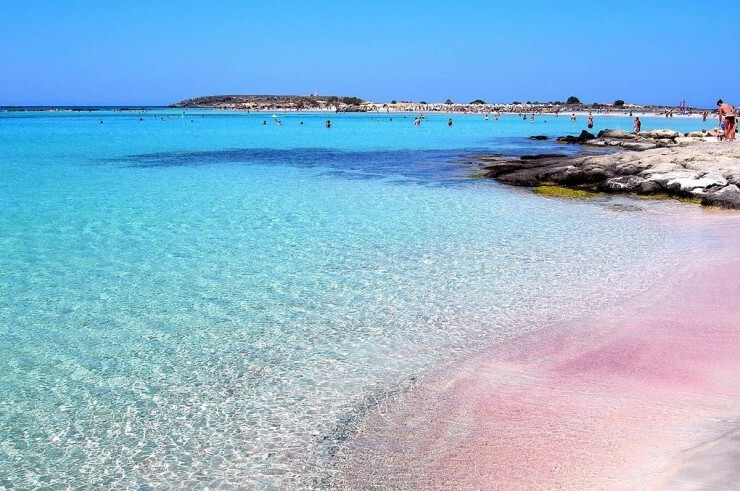 With such a dreamlike setting, the pink sands beach is the most popular destination in Paradise Island. Madeira belongs to Portugal. People have a special liking for her. Winston Churchill stayed in here and wrote war memoirs. Princess Sisi spent an unforgettable time in Madeira. The last emperor of Austro-Hungary lived in here with family after the abdication. Not only does Madeira have enchanting sceneries, but also is full with touching stories. This is my first video blog. 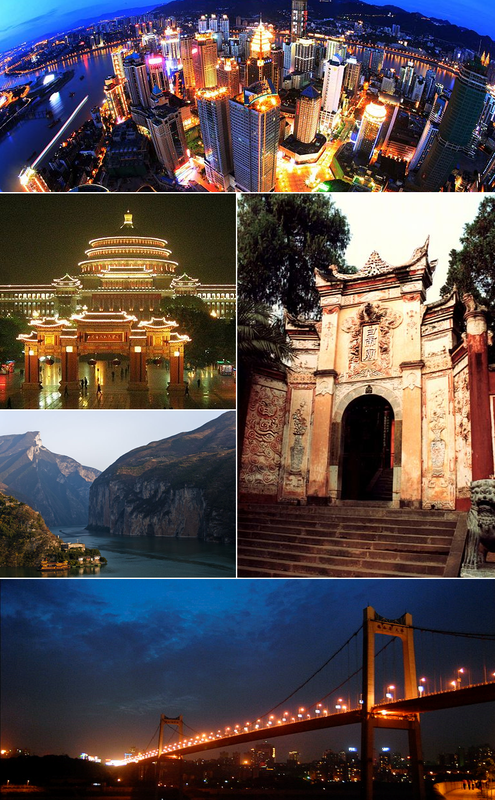 I will dedicate it to my hometown——ChongQing. It is the sister city of Toronto. In this video, I will talk about my hometown’s famous sights and cultural customs very briefly. However, this video is only a tip of the iceberg. I will provide more beautiful sceneries and traditional food in my future blogs. Today I will introduce 5 funny&important tips for tourism emergency events. Friends who did not read this blog, good luck to you too. If the oxygen masks come down, put yours on before helping others. If your neighbor is your ex, in this case, let’s forget it. Encountering the fierce wild dogs. If you meet unreasonable wild dogs during hiking, firstly, calm down. Then check whether there are some food (like meat) to bribe them. If you don’t have, run! It doesn’t matter that you cannot run fast. As long as be faster than one companion, you can have a rest. When you are holding bonfire parties, silk stockings are horrible things. They are lighted by spark easily. Thus, ladies please take off stockings before going to the camp-fire party. And some gentlemen, please refrain your special hobbies. If your next destination is on the seismic belt, remember never sleep naked. Otherwise it is hard to choose covering your face or body with hands when you are rescued by rescue teams. If you live in upper floors of hotel, escape from windows is the fastest way. I mean, it is the fastest way to die. Only when you live in the first or second floor, you can escape from window successfully. What’s the foundation of this claim? Reports of global survivors. If you meet a too serious fire, so that cannot aid yourself in hotel, use a wet towel to cover your mouth and wait for firemen. You can arrive to ground by extension ladders and fire belt. Should your face or back toward the wall when you are using fire belt? Of course face! Firstly, avoid the fear of heights. Secondly, don’t forget that there are a lot social enthusiasts taking photos for their twitter. 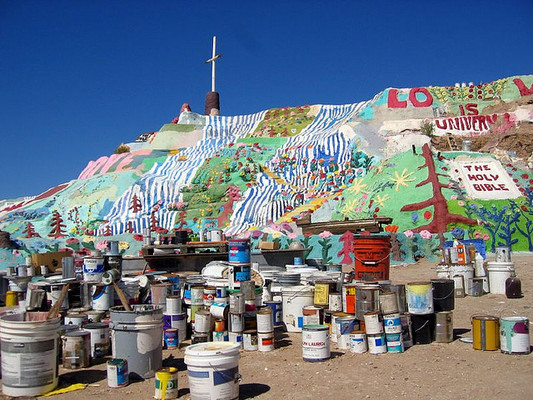 Recently, In Colorado Desert (California, U.S.), a Salvation Mountain has been built. What endowed this mountain with beauty was an old man’s faith. 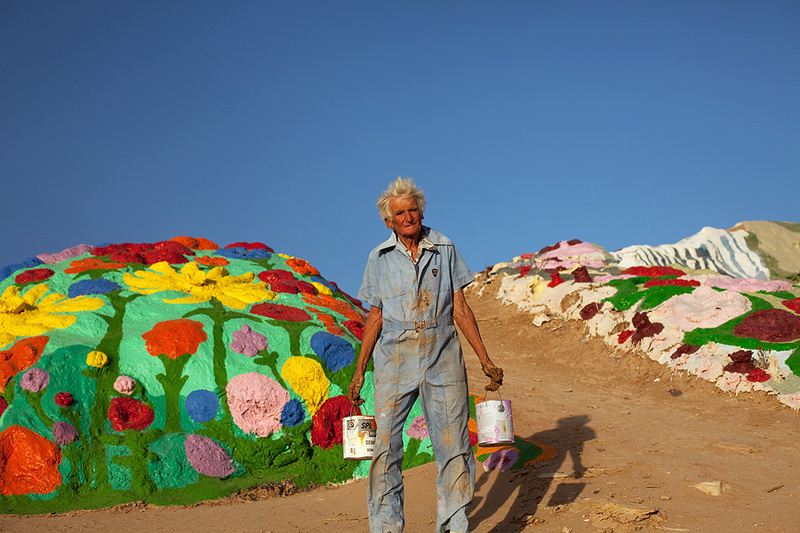 He was the unique resident of this area and created the ornately Salvation Mountain with his hands and life. 1931, there was a barren desert. At the same year, an ordinary boy was born on a farm. Like what other teenagers did, he went to school, joined the United States Army, and finally became a guitar teacher. Until 1967, he found his faith. 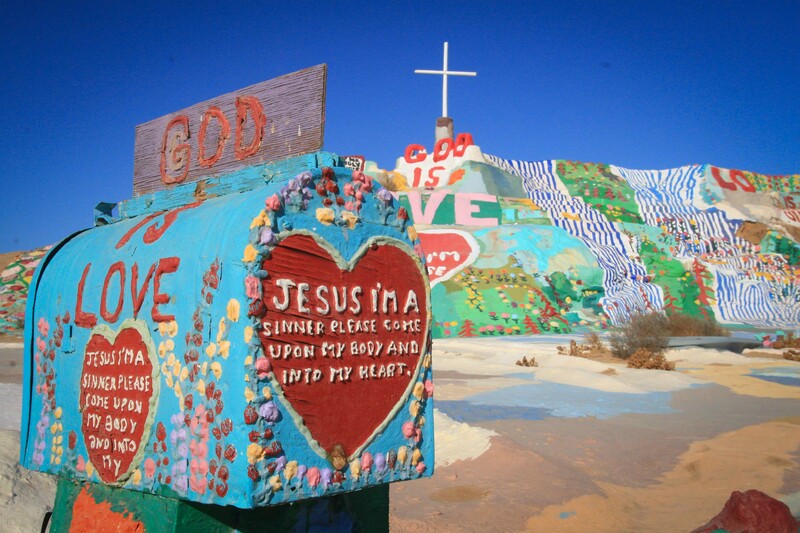 He believed “God is love” into his heart, and then decided build a salvation mountain in the desert in order to spread love and happiness to the bleak desert. Sand was embedded into his wrinkles. Exposure to sunlight made his skin become rough and redness. Malnutrition let him be emaciated gradually. But his passion has been unwavering. There are no people, no electricity, and no water. The old man got up at 5 o’clock every morning, then rode his old bike to fetch water. Sometimes, he spent half a day at the dump to find half a gallon of paint of which only half was usable. 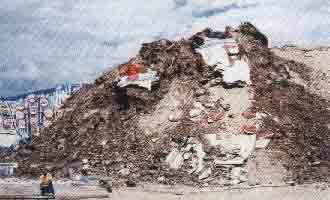 Afterwards, he used cement to stick materials from garbage heap together by hands. 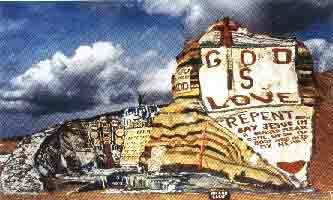 Rome was not built in a day and neither was the salvation mountain. 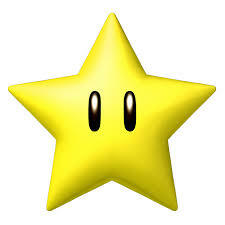 After one thousand four hundred and sixty days and nights, it had the initial appearance. However, a fierce wind gave him a trick. His outcomes collapsed beyond recognition. That night maybe was the saddest night. Gentle moonlight comforted this ruined landscape and his sorrow. The next morning, he still got up at 5 am to collect water and paint as before. He still thanked god for showing him that the mountain was not safe, and he need try harder. The old man sacrificed more than 20 years for the desert. During this period of time, the outside world has developed rapidly. The Internet connects the whole world. He was still living in the most primitive way of life: no water, no electricity, no mobiles, and no neighbor. At first, just a few people knew him. They went through the vast desert, and suddenly were fascinated by a colorful mountain. 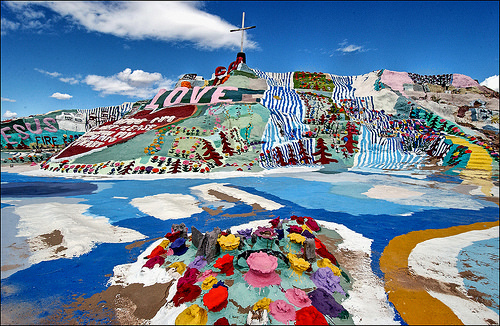 Subsequently, Salvation Mountain began to appear in the films, news, and fashion magazines. More and more people came to Colorado Desert to listen to stories of the old man and the mountain. But his health condition became worse and worse. Although he could hardly see where to walk, he did not want to give up painting. 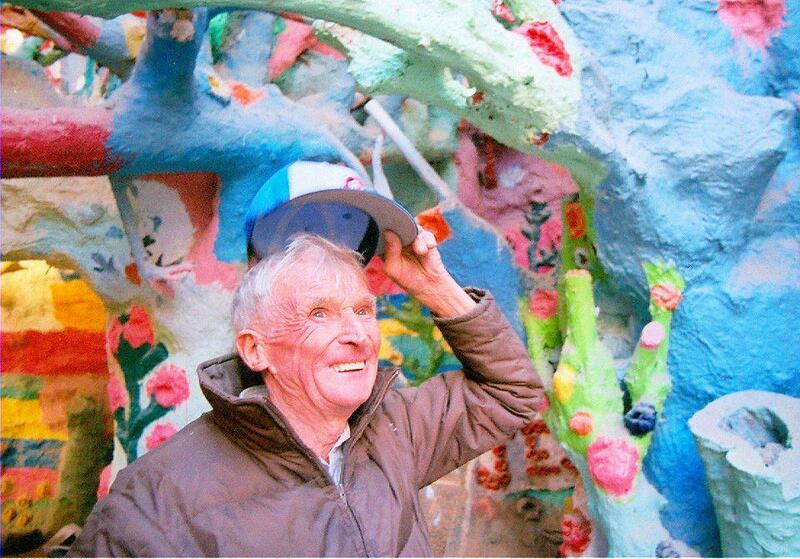 Although he suffered from alzheimer’s disease, he was not willing to leave the desert. 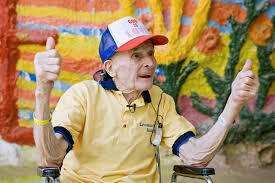 At 2014, the old man ran out of his last paint. Since then, he went to the heaven，and became a god’s gardener. 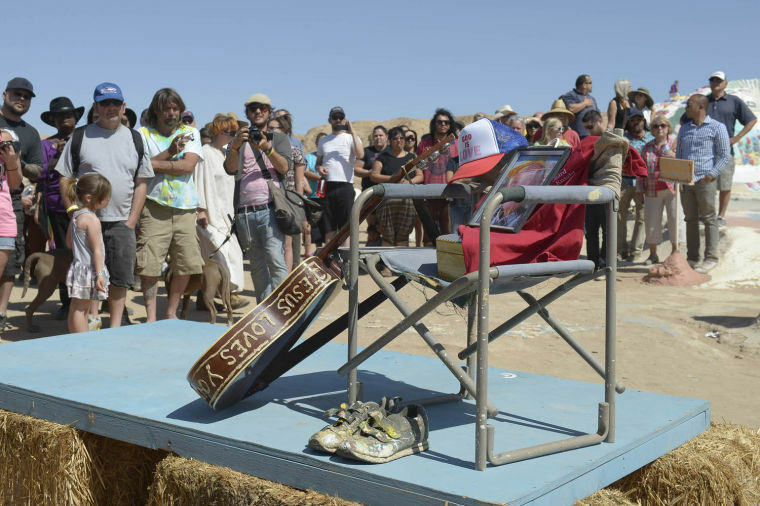 People who are moved by his story held a small farewell ceremony. Then people knew how simple his relics were: an old guitar, a pair of shoes which were full of paint, and a chair. His name is Leonard Knight. Maybe writing his name at the end is correct because you already realize his lonely life. 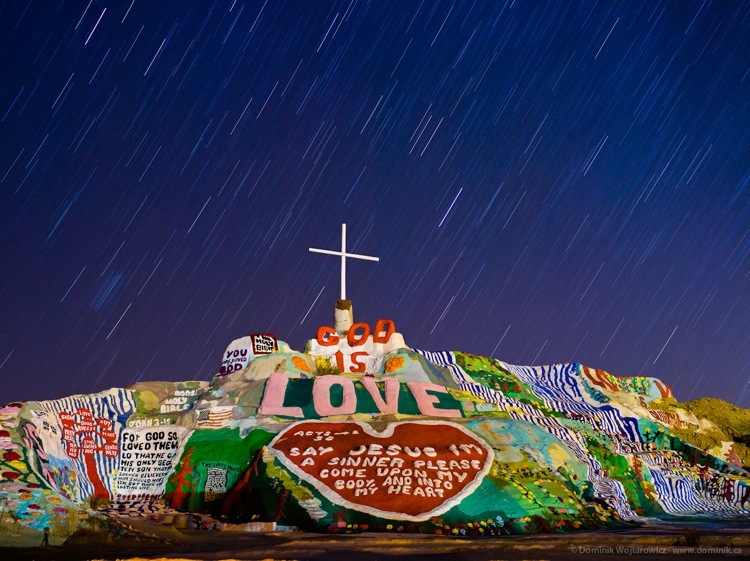 If one day you will go through Colorado Desert, please do not rush your time because here was a lonely man contributed his entire life to build a beautiful longing for us.